These hypnosis videos show how hypnosis works and provides real hypnosis sessions for curing a snake phobia and stopping smoking. These videos show that hypnosis induces a deep state of relaxation and replaces all the distracting negative thoughts with a resounding positive thought. By replacing the "I can’t" with a resounding affirmation that "I can"
these hypnosis videos show how instinctual responses can be broken and replaced with better habits of living. 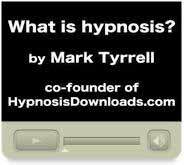 In this video Mark Tyrrell explains how hypnosis works. Hypnosis has been used to help people feel more confident in social situations, to overcome phobias, and stop smoking. Mark Tyrrell highlights that hypnotism works at the instinctual level, or at the REM (or hypnotic state). Phobias are instinctual responses. Phobias don't occur at the conscious level but at the subconscious. Here Mark Tyrrell shows how hypnosis can treat a person with a lifelong phobia of snakes in under an hour. He uses the hypnotic technique known Fast Phobia Cure Rewind Technique. There is also a 3 month followup in the subsequent video. The client, who is a DJ in a bar is still smoke-free 18 months later. This video demonstrates hypnotic phenomena, catalepsy, age regression and fast learning.